A CCTV footage from a restaurant in China has gone viral. In the footage, a pregnant woman knowingly trips a 4-year-old boy who suffers from heart disease. She did this after being annoyed by the kid who was running here and there playfully. After the video went viral, the woman was bashed by many for this act. 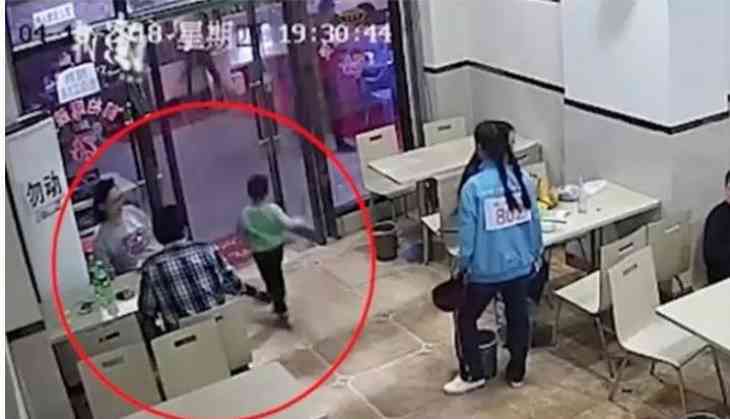 In the viral video, an unidentified boy ran into the restaurant pushing past a curtain and possibly hitting the woman and spilling some food on her. The couple whom the child passes by warned him but he probably didn't realise what he did. When the boy was exiting the restaurant in a similar playful manner, the pregnant woman stretched out her leg to trip the child over. The boy hadn't noticed the obstacle and tripped over and fell to the ground. The worst thing about the whole episode is that neither the woman nor her husband came forward to help the kid. According to a local newspaper, the child suffers from heart disease and post this accident he was admitted and diagnosed with a mild brain injury. He was hospitalised for two days. After recovery when the child shared with his mother that he was deliberately made to fall, she checked the footage and filled an FIR against the woman who did that. Police said that they would detain her for 10 days and penalise her 1,000 yuan but when she said that she was seven months pregnant, the victim mother decided to take back the case.